20th Century Fox knows what they have in The Maze Runner director, Wes Ball, and they're keen on keeping him around. Deadline reports he's been tapped to direct their upcoming adaptation of comic book series, Mouse Guard. Ball has quietly mounted one of the more successful YA franchises in recent years. The Maze Runner quickly surpassed Divergent, which opened the same year, by nearly $100M. The sequel, Maze Runner: The Scorch Trials, was also a success with $312M worldwide. The final leg of the trilogy, Maze Runner: The Death Cure, opens in January. With Mouse Guard he'll be able to stay in the arena of epic-sized fantasy, ironically in a story full of tiny characters. The acclaimed comic was created by David Peterson and follows a team of medieval mouse warriors in a world without humans. War for the Planet of the Apes' Matt Reeves is on board as a producer, and some of the same motion capture tech he used on that film will be utilized, which is pretty cool. Could we see Fox reach out to Andy Serkis if he isn't too busy? Adding to the film's rather awesome cred is writer Gary Whitta, who recently penned Rogue One. 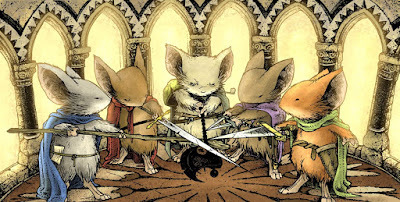 If you haven't read any of Peterson's Mouse Guard comics now may be the time to get on that. I have a feeling these are going to be huge movies that will finally put Ball on the map.